Goody texted me earlier this week when I was still in San Diego and asked if I wanted to do a longish swim at Pineview today. It's been at least a month since I have been swimming with him and I wanted to get a longer swim in before Slam the Dam, so I told him I was in. My wife dropped me off at Goody's house and then took the boys to the dinosaur park. Goody showed me the awesome video that Gords took of him swimming to send to him new coach. I need to get Gords to film me! After a quick cleaning before Goody's realtor brought someone by to see his house, we were off to the lake. The water was calm and a little chilly. I lost my thermometer somewhere in Bear Lake so I couldn't take the temperature. I would put it somewhere in the mid to upper 60's. It took me a while to get used to the water temperature, but after a while I was good to go. Goody took us along the "dam route" which follows the shore from the parking lot to the dam and back. We stopped for some bars, gels and Gatorade before heading off again. 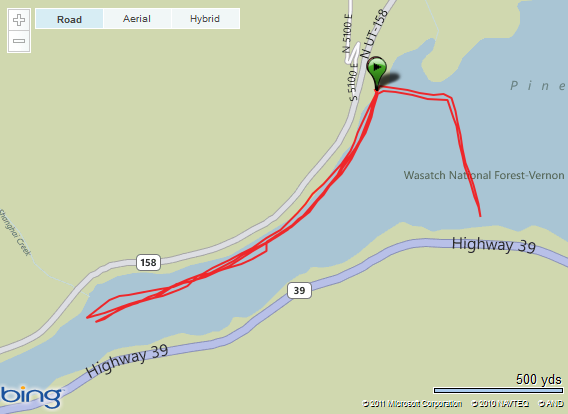 Next we did the "buoy route" which follows a line of white "no wake" buoys across the reservoir and back. We stopped again for another quick gel and drink and then did the "dam route" again. All together, we swam 4.5 miles and we both felt good about next week's race. My arms felt like I was wearing those wrist weights for the first 2.5 miles or so. I don't know if it was the gels finally kicking in or what, but after that point I was feeling better and pushed it a little faster to the dam and back. "It would be really cool to swim across Bear Lake next summer. I bet with almost a full year of training I could do it. I need to find a training plan that I can stick to. How many yards / miles a week do I need to be swimming to be prepared for a 20 mile swim?" I told Sabrina about possibly trying the lengthwise Bear Lake swim next year and she was totally supportive. The next step, I think is to talk to some people and put together a training plan to get me to where I need to be physically. I am a little worried about the mental preparation. This will be MUCH farther than I have ever tried to swim before. Thanks Goody for a great swim! As always, it was good to swim with you!